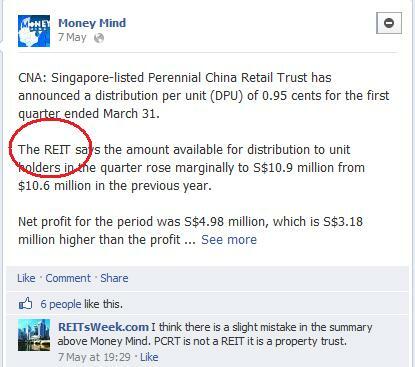 What is the difference between a REIT and a Property Trust? What about REITs and Stapled Securities? Real Estate Investment Trusts (REITs), Property Trusts and Stapled Securities are three different vehicles that a security investor can get into property investments. But some investors are fond of using these terms loosely without understanding the fundamental differences between them. In fact, it is not uncommon to see even respected mainstream media confusing these terms and using them interchangeably and inappropriately. 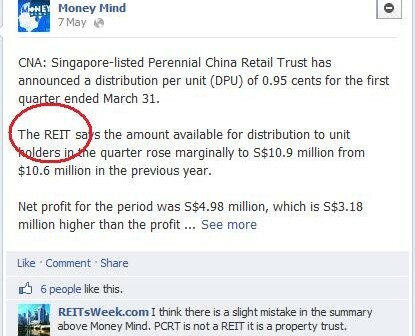 Channelnewsasia's Money Mind had erroneously referred to the Perennial China Retail Trust as a REIT in a story. It does not help that these terms are not regulated by the authorities. A REIT could call itself a Trust and similarly a property trust could call itself a REIT without having the obligation of operating as one as per the guidelines stipulated by regulators. In this article we will present to you the key differences between these 3 types of securitized real estate investments and why it matters that you understand the nature of each carefully in order to make an informed investment decision. Understanding the differences between REITs, Trusts and Stapled Securities is important when making an informed investment decision. In most jurisdictions, in order for a collective property investment to call itself a REIT it must pay out a minimum of 90 percent of its rental income to unit holders annually. This comes on the back of requirements of minimum assets sizes and restrictions on business activities. REITs are also subjected to limits on the amount of loans that they can take. 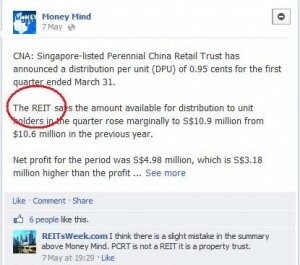 In Singapore, the gearing limit is 60 percent for REITs with a credit rating and 35 percent for REITs that are unrated. The regulations imposed on REIT are enforceable by the authorities and listed REITs are subjected to a high degree of transparency and scrutiny by the government and unit holders alike. With so much restrictions, why does a collective property investment bother to go through the trouble of manifesting itself as a REIT? The short answer - favorable tax treatments. As long as a REIT satisfies the conditions stipulated by regulators, it is exempted from corporate taxes and duties that are usually leveled against property investments companies. This means more income from your properties overall despite the stricter amount of regulations that you will have to comply with. Listed Property Trusts are also collective property investments that pool money from unit holders primarily to invest in income producing real estate. Rental income is similarly distributed to unit holders after deducting costs such as management fees and other overhead. Like REITs, Property Trusts are also by collective investment codes and other regulations that may be imposed by the bourses in which they are listed. However, and herein the most important difference between REITs and Property Trusts, is that Property Trusts are not obligated to pay out a minimum amount of its rental income to unit holders. It is also not subjected to the leverage and asset size limits that REITs are imposed with. This means that should a Trust manager decide that business is bad for a particular year, it may not distribute any rental income and unit holders can be left with no income distribution for the units they hold at the end of the financial year. Property Trusts do not receive the same types of favorable tax rulings that REITs enjoy. 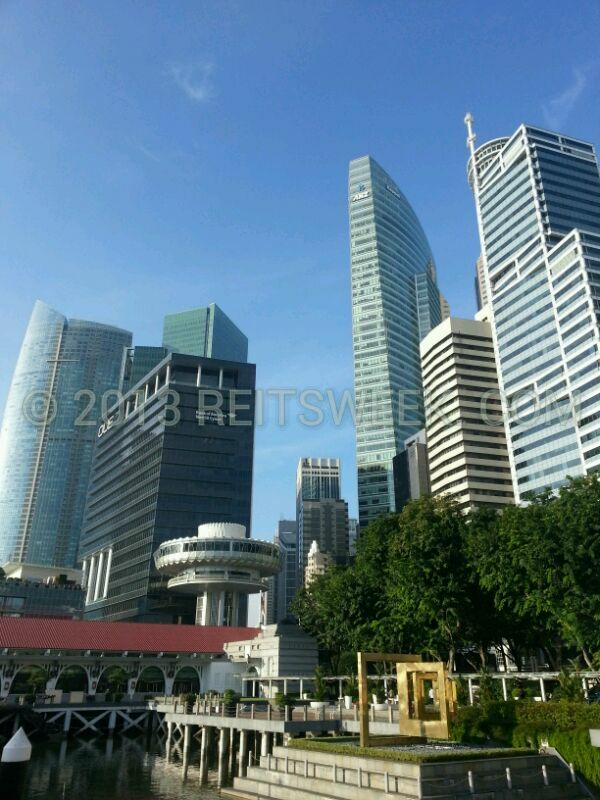 Examples of Property Trusts in Singapore that have often been confused as REITs by the media include the recently-listed Croesus Retail Trust and Perrenial China Retail Trust. In the context of securitized property investments, Stapled Securities are listed property investment securities that can be a bundle combination of either REITs, Property Trusts units or even property stocks. This commonly happens when a securitized property investment vehicle decides to apply a REIT model to a certain segment of its property portfolio while taking on a Trust model for another segment to form a single trade-able unit known as the Stapled Security. In this manner, the manager of the Stapled Security need to be bound by REIT regulations only for the segment of the portfolio that adopts the REIT model. He is then free to pursue other plans for the properties that do not require compliance to REIT regulations. Hence a Stapled Security is obligated to pay a the minimum amount of rental to unit holders only for the properties that are adhering to a REIT structure. An example of a Stapled Security is Singapore-listed CDL Hospitality Trusts which comprises of CDL Hospitality Real Estate Investment Trust and CDL Hospitality Business Trust. Another prominent example of a Stapled Security in this region is the KLCC REIT in Malaysia that comprises of REIT units and property stocks of KLCC Property Holdings Berhad (KLCCP). Stapled Securities are similarly bound by listing and reporting regulations that may be imposed the the respective bourses. These are the salient differences between a REIT, a Property Trust and a Stapled Security. Several more technical differences exist between the three but its full breadth will not be covered by this short article. But the main features covered above will help you to make a more informed decision as an investor. Oops! Typo amended. Thanks Dividends Wizard! The correct parlance for Property Trust should be “Business Trust”. This is a structure unique to Singapore. The correct parlance for Property Trust should be “Business Trust”. This structure is unique to Singapore.